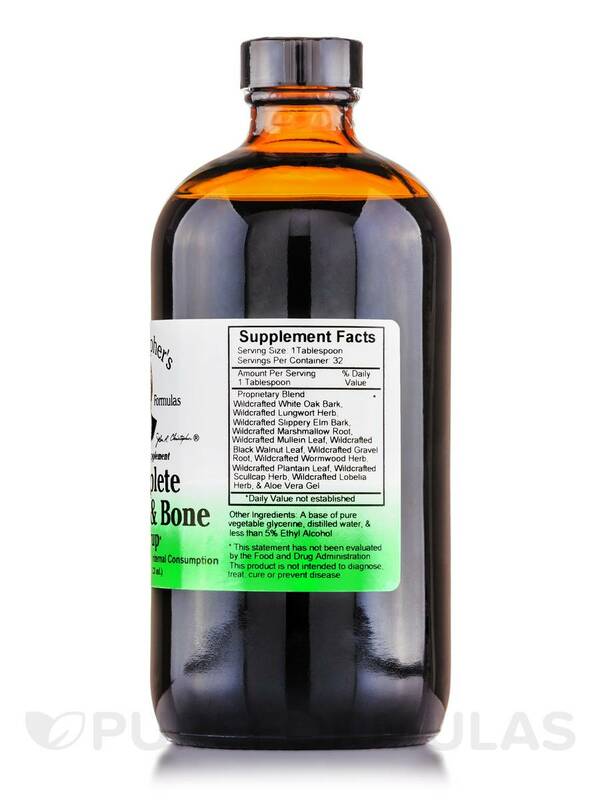 A synergistic combination of herbs for bones‚ flesh & cartilage. Bones play a major role in our body. They provide structure‚ protect organs & anchor muscles. Skin care along with healthy lifestyle choices can help slow the natural aging process. 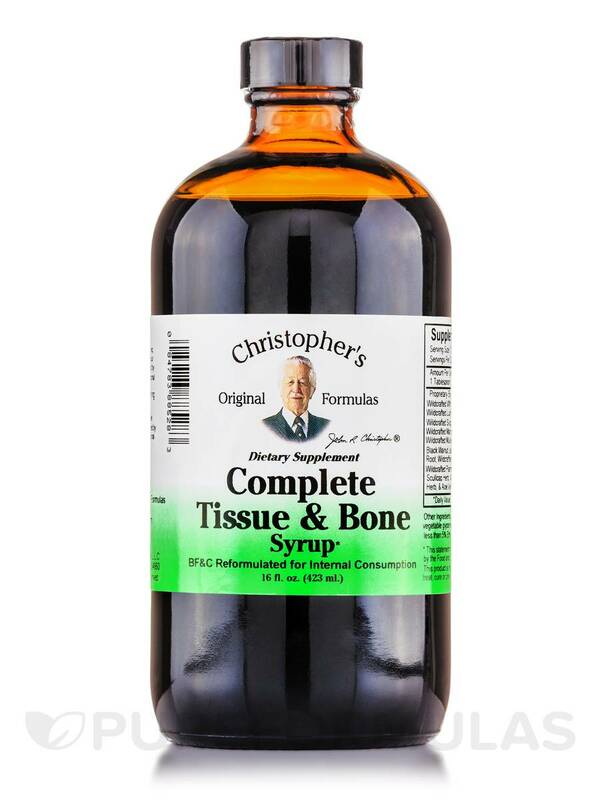 Dr. Christopher's time-tested Complete Tissue & Bone Formula supports bones‚ skin‚ tissue‚ hair‚ nails‚ teeth & gums. Wildcrafted White oak Bark‚ Wildcrafted Lungwort Herb‚ Wildcrafted Slippery Elm Bark‚ Wildcrafted Marshmallow Root‚ Wildcrafted Mullein Leaf‚ Wildcrafted Black Walnut Leaf‚ Wilcrafted Gravel Root‚ Wildcrafted Wormwood Herb‚ Wildcrafted Plantain Leaf‚ Wildcrafted lobelia Herb‚ & Aloe Vera Gel. 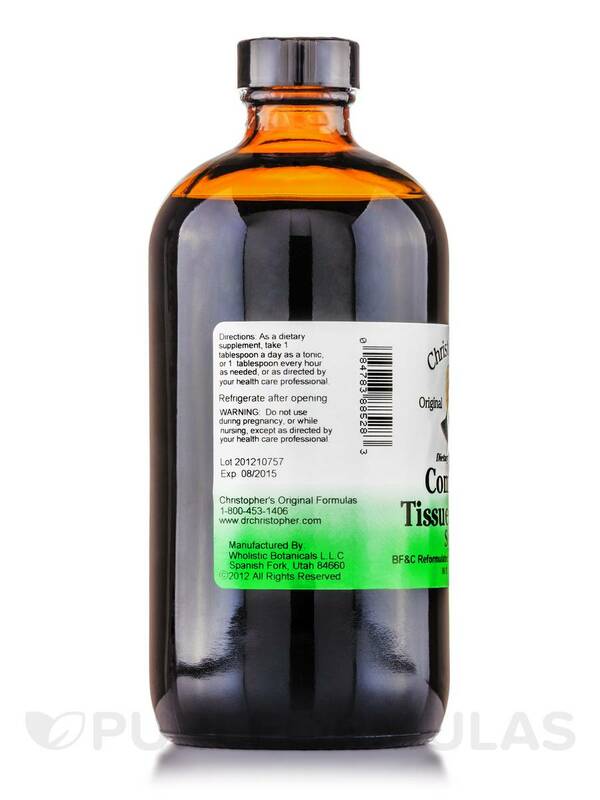 As a dietary supplement‚ take 1 tablespoon every hour or 1 tablespoon every hour as needed‚ or as directed by your health care professional. Refrigerate after opening. Do not use during pregnancy‚ or while nursing‚ except as directed by your health care professional. Tastes gross even with juice.